A fire in a Brooklyn apartment devastated many lives in a few short hours. Lives were lost, property damaged, family members moved on, and 2 cats were left behind in the burned out remains of what was their home. For almost a year, the pair lived alone among the apartment building ruins, learning how to fend for themselves. They left the house during the day, to hunt. And at night, came back to what they once knew as the security of their home. The New York based rescue group, KittyKind heard about the kitties’ unsafe situation and wanted to help. It took a few weeks, but the cats were rescued and fostered together. Nina was eventually adopted but it was decided the cats needed to be separated because Nina was bullying Kenny. For his own good, Kenny had to move on. He went through a few more unstable situations and is with yet another foster and hoping to find his forever. 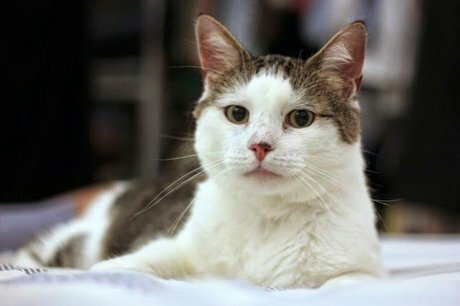 Kenny is 9 years old and FIV positive. FIV is Feline Immunodeficiency Virus which is very misunderstood. Kenny is essentially a healthy cat and with a proper diet, capable of many more healthy years. Kenny is described by his rescuer as loving and playful but mellow. 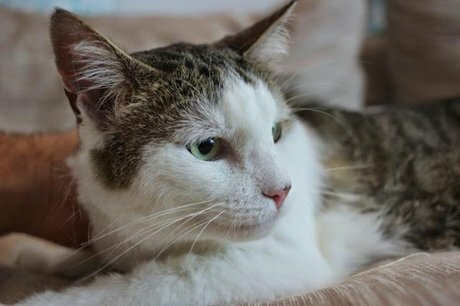 This feline has had his run of bad luck and his rescuers are determined to find him a forever home. For more information about how you can adopt Kenny check out his profile on KittyKind.